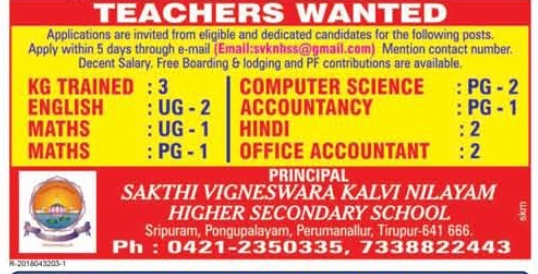 Sakthi Vigneswara Kalvi Nilayam Hr Sec School, Tirupur has advertised in THE DINAMALAR newspaper for the recruitment of Teachers vacancies. Interested and eligible job aspirants are requested to apply with in 5 days. Check out further more details below. About School: School was founded on 2nd June 2002 by the registered body of 'SRI JAYARAMU EDUCATIONAL TRUST'. We are committed to provide this Bharath children a meaningful educational environment. Institute applies character building as well as academic excellence. we do want to nurture the young mind in an environment that embraces individual, class, family and society as a whole.